Where’s the get spiritual quick kit? Christmas sugar cookies. 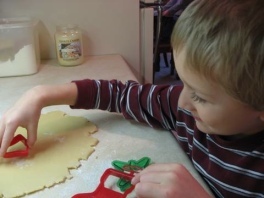 Do you remember the fun you had as a child making sugar cookies with your family at Christmas? Do you remember the enjoyment of cutting out the shapes, little snowman, the star and Christmas tree shapes with the cookie cutters in the gooey white dough? I know it’s fun because I’ve watched my children and the joy with which they cut the shapes and spread the frosting and add the sprinkles and other decorations after the cookies come out of the oven. Great fun — great memories. I’m told, these days, that all the fuss of Christmas cookies is behind us now. At your neighborhood grocery store you can buy a Christmas sugar cookie kit. The dough is already cut and the decorations are all included. Now you don’t have to fuss with mixing the dough or cutting shapes or making frosting — just bake and eat. Do you ever catch yourself looking for the next quick fix for your spiritual life? Like the Christmas cookie kit? Sometimes we think that living the Christian life should be like buying the Christmas cookie kit. No muss, no fuss, nice and easy. But Colossians 3 makes it clear that there are no “get spiritual quick kits” — we are, on the contrary, told to be all about killing sin, putting to death the earthly in us — Colossians 3:5 says that we are to put to death therefore what is earthly in you… And then there are characteristics of Christ-likeness that we are to be putting on in the place of the sins we’re to kill off. Colossian 3:12 says, Put on then, as God’s chosen ones, holy and beloved… and then goes into detail about the Christlike characteristics that we are to actively make a part of our lives. Psalms 119:35 Lead me in the path of your commandments, for I delight in it. There is great hope and joy and delight in applying the commandments of all of God’s Word to our life. And lest all this talk of work in our walk with Christ and the realization that there is no “get spiritual quick kit” discourage you, let me remind you that you have a comforter who is with you to help you. Remember John 14:16. The idea here is that the Holy Spirit is our Advocate and our Counselor and John 14:26 reminds us that the Holy Spirit is our Helper who will teach us all things and bring to our remembrance what He teaches us. Clearly the importance of being a self feeder in God’s Word can be seen here, otherwise how will the Holy Spirit teach us and remind us unless we put ourselves in the place of His wisdom, in His Word. And the Psalmist demonstrates the attitude we should have in Psalm 143:10. Psalms 143:10 Teach me to do your will, for you are my God! Let your good Spirit lead me on level ground! So don’t be discouraged that there’s no “get spiritual quick kit” — but be encouraged that what God commands that His children do, He enables them to do through the work of our Helper, the Holy Spirit. Maybe you realize that you really haven’t been working with all your might to put to death the earthly in you and to put on the Christlike. A good place to start would be to go to God in prayer and confess your sin before the Lord and thank Him for His forgiveness. Then thank Him for His helping, counseling, guiding Holy Spirit. And be certain to put yourself daily in God’s Word. Then make it your practice to pray daily for God’s help, guidance and wisdom — ask Him to help you be strong and courageous in doing the daily work of putting off the old and putting on the new, Christlike characteristics seen in Colossians 3 and elsewhere in God’s Word.